Kevin Slowey, 28, did not pitch in the Majors in 2012 – and was 0 – 8 during the 2011 campaign for the Twins – doling out an abysmal 6.67 ERA for his 8 Game Starts and some Relief Duty. 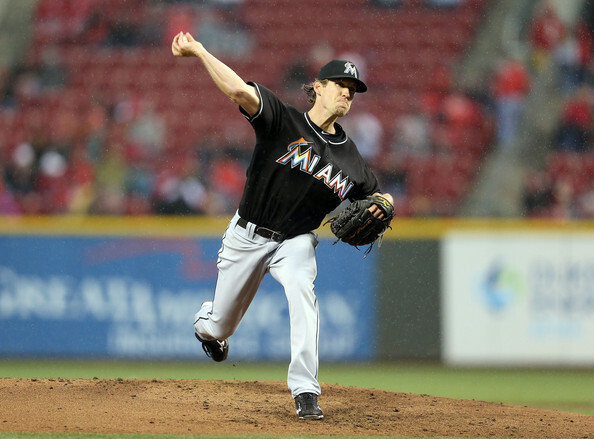 He is now the Marlins #2 Starting Pitcher listed in their Depth Chart behind Ricky Nolasco. Funny enough, the man from Pittsburgh has actually thrown well in his 5 Starts this campaign – featuring an 0 – 2 Record, however sporting a 2.43 ERA – with a 1.146 WHIP in his 29.2 Innings Pitched. Offensive support had definitely not been there. The 2013 Major League Baseball Regular Season is less than one month old. Nonetheless, the Marlins are still somehow 10.5 games behind the first-place Atlanta Braves in the N.L. East and 9 games out of a Wild Card Spot. The team with the second-worst record in the Majors, Houston, is still two games in front of Miami. The Marlins record of 5-19 gives them the worst Winning Percentage through April 27th of any team since the 2010 Baltimore Orioles. The 2010 Orioles lost 96 games on the season, and they played in the competitive A.L. East. The Marlins play in a division with the vaunted Atlanta Braves, Philadelphia Phillies and Washington Nationals – and seem like a lock to lose 100 games, and at this point, 110 losses doesn’t seem out of the question. The 2013 Marlins aren’t just terrible for one reason. Their first three starting pitchers, Ricky Nolasco, Kevin Slowey, and Wade LeBlanc might be the worst top three in the Majors. Slowey, who almost seems like the rock in the Marlins rotation right now, was a Minor League Free Agent this past winter – and didn’t sign until late January. With Adeiny Hechavarria and Logan Morrison on the Disabled List, a bad Infield just got even worse. Greg Dobbs, Donovan Solano, Nick Green, and Placido Polanco sounds like the infield of a bad Triple-A team, not a MLB franchise. The Marlins Infield is painful to watch. Coupled with a weak Starting Rotation – and a few other bats pulled from the Free Agent “bargain” bin, and the reason the franchise has struggled in 2013 becomes plain to see. If the Marlins continue to win games at the rate they are now, they’ll win a little over thirty-three games this year. Coming into the season, PECOTA projected the club to win 66 games and finish in the cellar of the N.L. East. Now, the Marlins front office would probably be pretty pleased if this awful team could manage to scrap together 66 wins. The 2013 team have been -2.7 Wins Above Replacement so far. With brutal fielding, pitching, and offense, this club could easily lose 110 games in 2013. This would make them the first team since 2003 Tigers to cross the 110 – Loss Mark. They might even approach the 1962 New York Mets for both Losses (120) and Win Percentage of (.250). If you squint really hard, there are bright spots in this Marlins organization. While it may be impossible for the organization to ever build a dynasty with Jeffrey Loria at the helm, there is help on the way. Christian Yelich, Marcell Ozuna, and Jake Marisnick all will be stars patrolling the Miami Outfield not too long from now. Jose Fernandez has signaled the rush of young pitchers that is ready to take over the franchise. Last but not least, the Marlins still have one of the best young players in the game in Giancarlo Stanton. So as bad as the 2013 season is going to be – there is hope for the team down the road. Unfortunately, The New Marlins BallPark is going to have a lot of empty nights of entertainment this year. The Marlins are going to struggle to draw fans, no matter how beautiful their artsy venue is. The 2013 Miami Marlins are one of the worst assembled teams of the last 15 years. It’s amazing that, in 2013, a team is starting Greg Dobbs, Placido Polanco, Juan Pierre, and Nick Green. Even if the Marlins weren’t planning on contending this year, the front office in Miami should be ashamed and embarrassed of the team they are putting out on the field everyday. 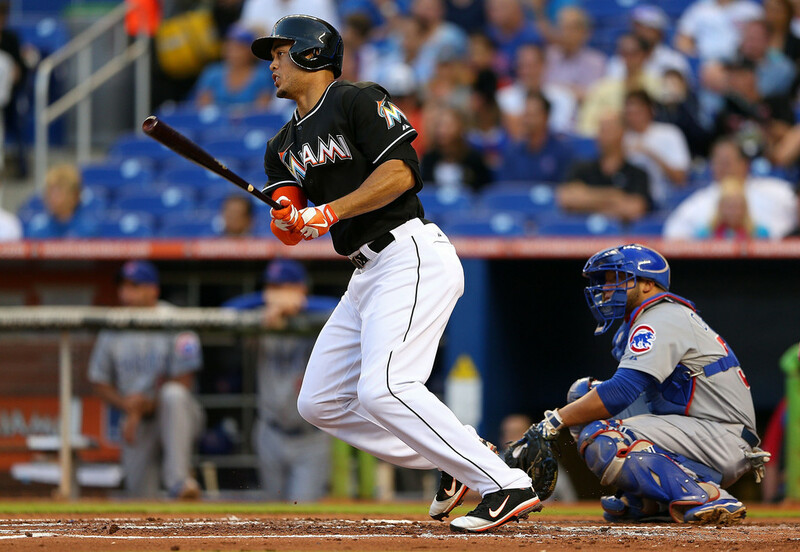 Giancarlo Stanton is one of the few bright spots on the 2013 Marlins roster. However, the opposition does not have to fear anybody else in the lineup. Therefore Stanton is going to have to learn to be more selective at the plate in waiting for a good pitch. He has fanned 24 times in just 67 At – Bats. His 3 Slash Line is .209/.329/.628 – with 1 HR and 5 RBI for his 18 Games Played. Last year Stanton hit for a Slash Line of .290/.608 (Led NL)/.969 – clubbing 37 HRs and adding 86 RBI in his 501 AB. Stanton picked a bad year to slump as he is Arbitration Eligible in 2014. He is under team control until after the 2016 season. Posted on April 28, 2013, in MLB Teams: Articles and Analysis, The Rest: Everything Baseball and tagged 2003 detroit tigers, @RJA206 on twitter, Atlanta Braves, baltimore orioles, baseball, chicago cubs, christian yelich, giancarlo stanton, greg dobbs, jake marisnick, jeffrey loria, jose fernandez, juan pierre, kevin slowey, logan morrison, marcell ozuna, marlins, marlins 2012 attendance, marlins 2013 attendance, Marlins Park, miami, miami marlins, minnesota twins, mlb, new marlins ballpark, new york mets, Nick Green, NL east, PECOTA, philadelphia phillies, ricky nolasco, sam evans, worst team in baseball. Bookmark the permalink. Leave a comment.